The last night of my stay was in a Strip view room for at Treasure Island. I received a "One Day Sale" email and it indeed had some decent rates. $39 for a regular or $59 for Strip view. Those email signups really pay off sometimes! I haven't stayed at TI since my second trip to Vegas when I was still dirt poor and only had a bed to sleep in because the guy who rented the room didnt come back all weekend! I am no longer broke so I sprung for the extra $20 for the view and ended up on the top floor with awesome view of the Mirage volcano and center Strip. I arrived around 1:00PM and checked in almost immediately with only about a 30 second wait in line at the Front Desk. The elevators are little bit of a haul from the front desk but closer to just about everything else. The room was a fairly standard newer Vegas room. In a twin queen room there is a combo armoire, desk TV Stand plus another chair and small table. It had been somewhat recently remodeled and everything still looked pretty good, there were no major carpet stains and all of the furniture was in good shape. The bed was the exception as it was pretty saggy. The bathroom has a combo tub/shower and a single vanity. It was also remodeled with stone tile and counter top, although curiously, it looks like they failed slap a coat of paint on the front of the vanity. It looked beat to hell! Treasure Island itself is probably the smallest of the major Strip casinos in terms of area with everything pretty close by. 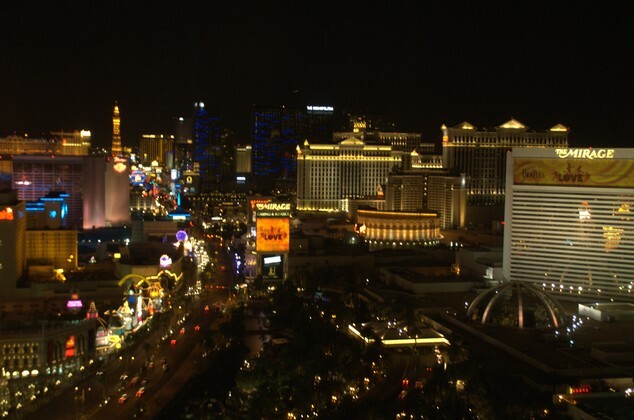 There is a handful of restaurants including all the Vegas standards; steakhouse, coffee shop, Italian, buffet. There also a Gilley's BBQ, complete with mechanical bull! I only ate at the pizza place and it served up an halfway decent slice at 11:00PM. The location is pretty good as well being across the street from Venetian and Palazzo with a monorail over to Mirage next door. The pool is certainly not in the Top 10 in town but serves it purpose if all you need is sun and water. No review of TI would be complete without a mention of the slutty pirate show, Sirens of TI. Well here it is... I haven't seen it, I have zero desire to see it and I will go out of my way to avoid it. Standing in a packed crowd of people who have been in the Vegas heat all day along with a few pickpockets just to see scantily-clad dancing pirates does not appeal to me. All in all, my stay at Treasure Island was fairly positive, especially for the price. It has everything you could ask for in a mid-priced Strip hotel in a good location. Like its neighbors, you aren't going to find any good plays at the tables or machines but thats to be expected. Otherwise, TI is a good option for most people especially Vegas virgins and partiers. Email will not be used in any way other than to reply!